It is an odd sensation to find oneself in the middle of a global media moment. As the women around me gently hissed at Ivanka Trump on stage at the W20 Summit in Berlin, hundreds of cameras flashing around me, I had to wonder how this slightly pantomime situation had evolved (I emitted an involuntary but heartfelt groan at the phrase 'he's been a tremendous champion of supporting families and enabling them to thrive' but otherwise kept a respectful silence). As one of Australia’s delegates to the new W20 Summit for the past three years, the goal has been to increase the recognition and influence of the newest G20 outreach group so that women can claim their economic rights. We have been advocating for a more active G20 agenda that takes women more seriously and improves women's lives. Our other related task has been to promote and increase the representation and status of women in economic governance and economic diplomacy. Three summits in, the W20 needed to suggest concrete policy solutions aligned to the current state of G20 negotiations. And for the W20 to be influential, it needs to speak in a way that resonates with hard-headed G20 Sherpa and finance track delegates. This has been a serious struggle for credibility. The G20 space is crowded and fluid, with high levels of technical expertise required in order to enter into policy dialogue. Lobbyists would call the G20 a high-threshold advocacy target. The W20 also had to be credible and aligned with the women's movement, especially in emerging economies, or face allegations of being another rich women's club. The author (centre-left) with German Chancellor Angela Merkel at the W20 Summit in Berlin. It was already clear that the German presidency of the W20 was the chance of a decade. 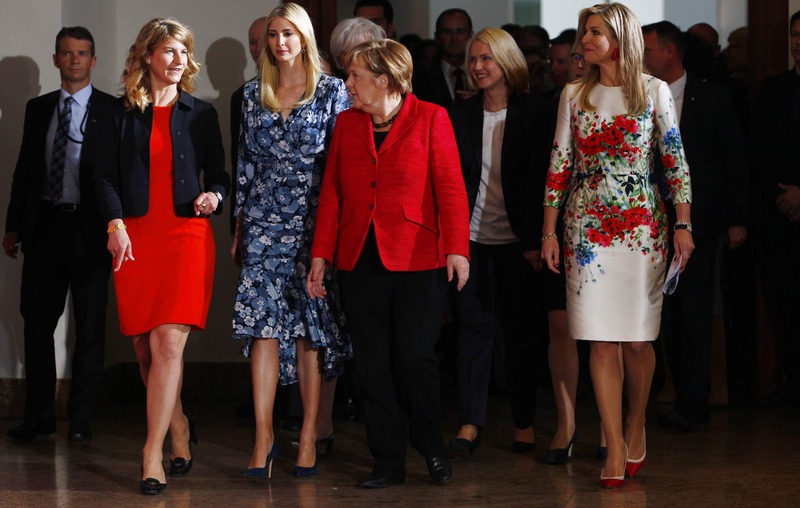 Then suddenly it was announced that Ivanka Trump will be invited as a panel speaker to the W20 Summit at the personal invitation of Chancellor Merkel, and immediately the media gaze intensified. There was exceptional global media exposure for the high-level panel invited by the Chancellor, which included IMF Managing Director Christine Lagarde, Canadian Foreign Minister Chrystia Freeland, Queen Máxima of the Netherlands, and a number of prominent female bankers and entrepreneurs, along with the First Daughter of United States. Other W20 delegates, including my colleague Anne Fulwood, have argued that this panel put the W20 on the media and political map. As news broke during Ms Trump’s insipid appearance that the Trump Administration was stripping all funding from the Office of Global Women's Issues in the US State Department, I felt less sanguine and more conflicted. There are lots of reasons for this type of story, such as the controversy around Ms Trump's murky role at the White House, and the state of the US-Germany relationship. Lots of terrible coverage focused on the floral trend and power-red the women wore (I am looking at you, the Telegraph and Footwear News). In that line-up of powerful women, the content was lost on all but a few media outlets, and the broader importance of the G20 agenda completely ignored. The politics behind Ivanka Trump's visit to Germany also received little comment or analysis. The obvious and stated intent of all this theatre was to secure international agreement and funding for a G20 Female Entrepreneurship Fund for women in developing countries, something I support as part of the broader financial inclusion focus of the G20. The details are sketchy. If Ms Trump works hard to deliver such a fund, all the better. Juliana Rotich spoke eloquently about the needs of women in developing countries to design their own solutions and be part of the solution. Her voice deserved to be heard more broadly. Still, only the impotent are pure, as Gough Whitlam said, and the W20 was the lead story in almost all print, social and broadcast media. The combined power of beauty, politics and celebrity is extraordinary, if utterly depressing to witness firsthand. Will that exposure translate to more support for the W20 agenda? So here is the real news. The W20 meeting under German Presidency was remarkable for three reasons. First, because of the strong support and related political message sent by the German Chancellor, who intervened on three different occasions during the two-day conference, spared no effort to advocate for women’s issues and pressed for results with an enthusiasm never before seen in a G20 leader. Second, because the W20 continue to press for G20 members to honour their promise at the Brisbane Summit to reduce the gap between female and male participation in the labour market by 25% by 2025. If the W20 does its job, it will mean 100 million new jobs for women. Three years have passed and progress is too slow. Across the whole G20 this gender gap has declined by just 0.6 percentage points per annum. I was able to ask the Chancellor directly to urge G20 members to boost their efforts to meet the target and make the monitoring process run by the ILO/OECD more transparent, with agreed indicators to make it easier to compare. The G20 made a promise in Brisbane that needs to be kept. Third, the digital inclusion of women is becoming a crisis issue if we do not want women to miss out on the digital revolution and remain again in the margins of development. The W20 urged Merkel to support the idea of a comprehensive five-year plan for gender-equal digital transformation, taking inspiration from the G7 STEM project but relevant for both developed and developing countries. So the W20 made governance history, strove to bring 100 million more women into the workforce and asked leaders to ensure women were part of the future digital economy. That is news! Airstrikes aside, the US needs Moscow to influence the Assad regime and negotiate an end to this sordid conflict.